Chavez is trying to manufacture a reality which casts him as the incarnation of “the fatherland”, supposedly on the brink of a gringo invasion. In that case, those who object to him don’t oppose a mere president of the republic – whose work all citizens have the right to scrutinize – but becomes an “enemy” of nothing less than “the fatherland”, a “lackey of imperialism.” Which, funny coincidence, ressembles nothing so much Bush’s own discourse: “you’re either with us or against us” and those who are against us are unpatriotic…Chavez and Bush are two sides of the same authoritarian, intolerant and arrogant coin. They feed back on one another. I know I really shouldn’t stray into US politics so much – but I can’t help but notice that GOP tactics are getting more and more reminiscent of the kind of stuff chavistas do. 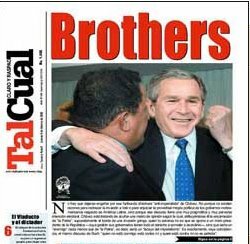 Remember the “mano pelua” that mysteriously altered the constitutional text between the time it was voted on and the time it was published? I thought this kind of shenanigan couldn’t imaginably happen in a first world country. Oh, but I was wrong. Senate Majority Leader Bill Frist and House Speaker Dennis Hastert engineered a backroom legislative maneuver to protect pharmaceutical companies from lawsuits, say witnesses to the pre-Christmas power play. The language was tucked into a Defense Department appropriations bill at the last minute without the approval of members of a House-Senate conference committee, say several witnesses, including a top Republican staff member. On the right-left axis, Republicans and Bolivarianos are on opposite extremes. When it comes to political tactics, they’re pretty much on the same page.